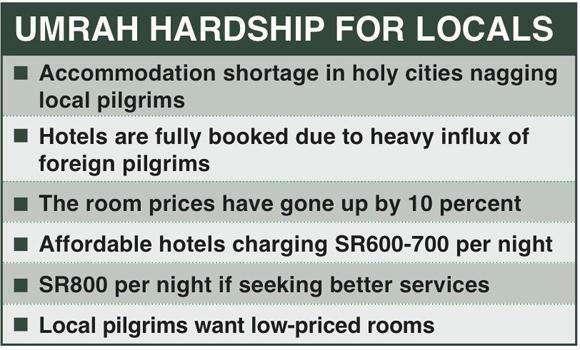 several local Umrah pilgrims complained about the soaring prices of the rooms which they said had gone up by 10 percent. 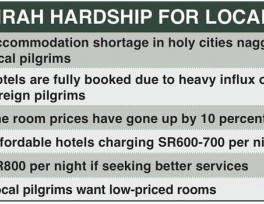 Accommodation shortage in the two holy cities of Makkah and Madinah and overcrowding are causing difficulties for local Umrah pilgrims. Hotels and furnished apartments near the Grand Mosque in Makkah and Madinah are fully booked by the Umrah pilgrims coming from abroad. “I couldn’t find a single room available for my family in Madinah over the weekend. We had to spend the night in the car and sleep in the cold weather,” said Syed Rafi, a Jeddah resident. Mohammed Ghafour from Riyadh said, “All the hotels near the Grand Mosque in Madinah have been pre-booked by the Umrah agents. There are no rooms available for the local pilgrims. Many of the local Umrah performers in Makkah prefer to stay in the Grand Mosque for the whole day whereas in Madinah they choose to sleep in the car. The unavailability of hotel accommodation has forced many of the local pilgrims to spend the cold nights in cars or outside the vicinity of the Haram. “It would be a good idea for hotel managements to reserve some rooms and make them available for the local pilgrims near the Haram in Makkah and the Grand Mosque in Madinah. It will become easy for the families with children and the elderly to spend their spiritual time in the holy cities,” said Ahmed Sayeed, a local resident. Moreover, several local Umrah pilgrims complained about the soaring prices of the rooms which they said had gone up by 10 percent. “Affordable Hotels in Makkah and Madinah charge SR600-SR700 per night. Those wanting better services have to pay up upward of SR 800 per night,” he added. A hotel manager in Makkah said, “As there is an increase in the number of Umrah pilgrims from different countries, the shortage of accommodation has spiked the prices of hotel rooms. He added that businessmen have made heavy investments in real estate in the two holy cities, so in order to reap a high return on their investment the hotel owners hike the room rates. Many other hotel managers also held the pilgrims responsible for the rise in price as they are ever ready to pay excessive sums of money for accommodation. Basheer Abdurub said, “We pay the room charges without bargaining because it is very difficult to find vacant hotel rooms.” He added that room rates have gone up since the development and expansion of the two holy cities as millions of Umrah and Haj pilgrims visit the Kingdom every year. And as the numbers of pilgrims will continue to increase, local pilgrims will have fewer choices and simply have to accept their situation. Summaiya Jaffer from Dammam said, “Pilgrims are more concerned about the availability of the rooms than their rates these days. In fact, hotel room rates have been an issue with local pilgrims for many years so there is nothing new about it.” Several local pilgrims suggested that the hotel managements should consider reserving a few rooms and make them available for locals at affordable rates.